Interesting partial dispensation with theme symmetry: We’ve got four business magnates in symmetrical spots, and each one is crossed by his corporate baby, with the companies not paired up symmetrically. 17a. [Founder of 6-Down], TED TURNER. 6d. [World’s most widely distributed syndicated news service], CNN. Not Turner’s only achievement—there’s also Turner Broadcasting System. 63a. [Founder of 47-Down], STEVE JOBS. 47d. [“World’s most admired company,” per Fortune], APPLE. 11d. [Founder of 36-Across], JEFF BEZOS. 36a. [World’s largest online retailer], AMAZON. 34d. [Founder of 58-Across], SAM WALTON. 58a. [World’s biggest private employer], WALMART. I often find cross-referenced clues irritating, but I liked how this theme played out. 26a. [Hit back? ], SIDE B. Cute clue. However: I want to know if any current songs are considered B sides to other hits, or if that phenomenon went the way of the cassingle and the 45. Also, would you agree that B SIDE is a better version of this answer than SIDE B? 32a. [“That’s not news to me”], “YES, I KNOW.” This is often heard around my house, with my son and I competing to bring the freshest news headlines to the family’s attention. Hard to get one the other hasn’t already seen too. 49a. [Where to find a soft drink’s promotional code], CAP. I bought three bottles of pop today: one Gale’s Root Beer, locally made by my favorite dessert chef; one Moxie, which I’ve never had; and one Ale-8-One, which I had never even heard of before. The shop where I found these treats may be closing this month. Aww. 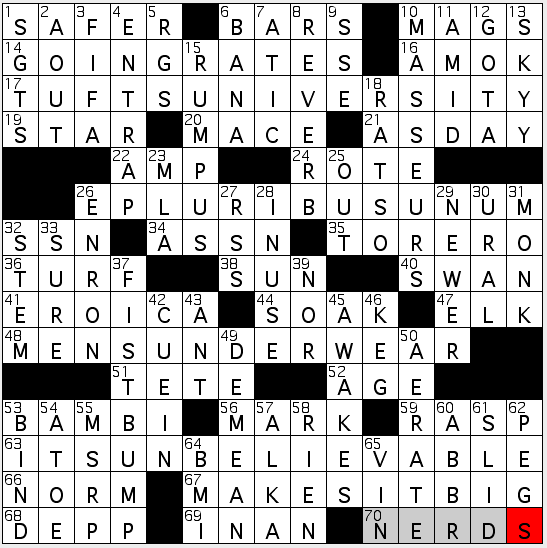 So I don’t think JOEY MCCUSTY is going to be a theme answer in a future version of this crossword. 66a. [Cybermemo], E-NOTE. This entry is about as ghastly as E-MAG. I liked seeing MOROSE, BOREDOM, “SURE CAN,” and a summer BREEZE in the grid. Less keen on ALERO, ODELL, ALTE, EDO, and YSER. 3.8 stars. Snappy theme, fill a bit less so. 17A. TUFTS UNIVERSITY [Where actor William Hurt studied theology]. Now there’s an interesting bit of trivia. Sadly this superb actor has a reputation for not exactly being Mr. Nice Guy. Which I guess gives him feet of clay. Like most of us. But how serendipitous for puzzle purposes that one of his films scheduled for release in 2015 is The Moon and the Sun. (Hah! And there’s ol’ Pierce Brosnan again. No more “1st Irishman,” but now King Louis XIV himself. [See last week’s write-up if this makes no sense…]) Grid-spanner, too. Nice. 26A. 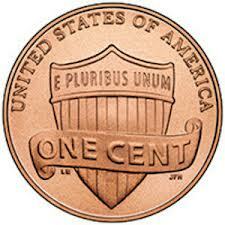 E PLURIBUS UNUM [Phrase that’s on the money?]. Exactly. 63A. “IT’S UNBELIEVABLE!” [Sports commentator’s reaction to an upset win]. 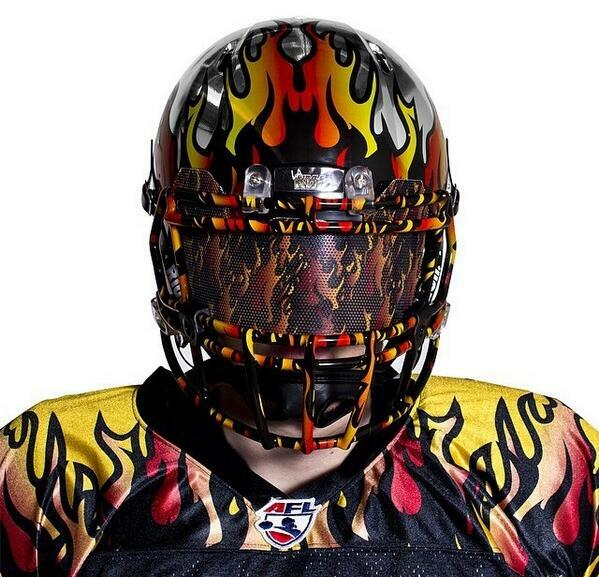 A hyperbolic reaction in the sports world? What a shocker! Why only last week at the World Cup… So, timely fill. Ditto FIFA [World Cup org.]. And the matching grid-spanner, too. MAKES IT BIG is a terrific phrase but the surprise today is that it’s not clued in connection with achieving personal success, rather as a process one applies to an image, [Enlarges a photocopy?] say. Other tricky clues come with [Lush surroundings?] for BAR, since “lush” is a noun here and not an adjective; and [Former German capital] for MARK (monetary capital…) and not BONN, one-time political capital. Oh, and how could I forget the [Fee schedules for pay toilets?] “GOING” RATES pair–bolstered as it is by IN USE [Occupied, like a loo]? 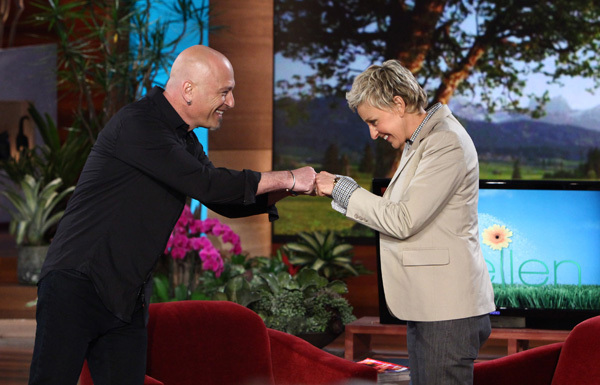 My inner-fourth-grader is chortling with embarrassment and delight. Higher-brow types might notice instead all of the musical references. Not [Trumpeter on a lake], which gives us SWAN, but more like “EROICA” [Nickname of Beethoven’s Symphony No. 3], the rhyme-y [Tuning pins on violins] for PEGS, REVERB [Recording studio echo], AMP (twistily clued as) [Rock blaster at a concert] and even BMI [ASCAP alternative]. 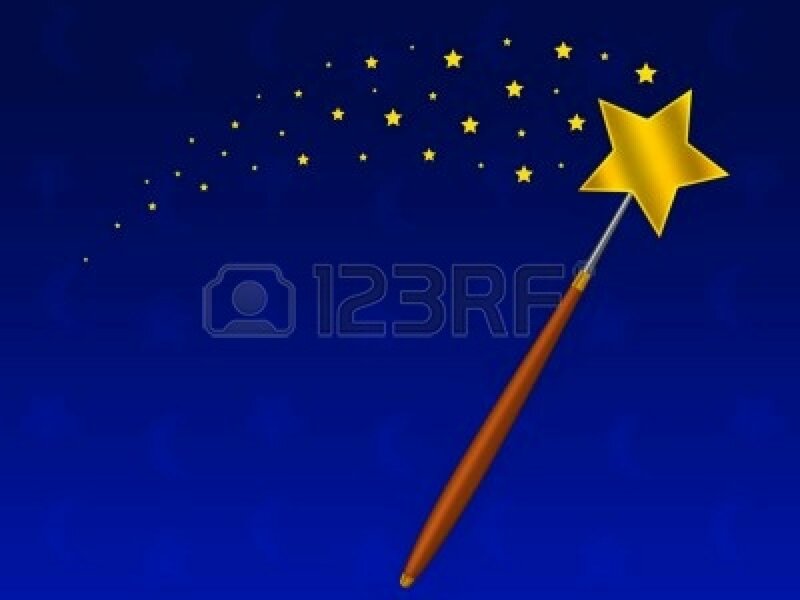 If I had my druthers, STAR woulda been clued in connection to the sun, but I do love the image of [Magic wand topper], too. And if you’re at all like me, you have no idea what MSRP [Letters on a new car window] means. If you’re like me, you even look it up periodically and then promptly forget. Okay. So let’s try this one mo’ time: Manufacturer’s Suggested Retail Price. And now lemme run that magic wand over my head to see if I can get that info to stay in the brain this time! Good morning, everyone!! Hope all of you are having a good Tuesday so far. Well, this rainy weather to begin this definitely will have some seeing red, like this very nice puzzle authored by Ms. Lynn Lempel. In it, common terms and/or proper nouns are altered by adding “RED” into the answer to create puns. REDONE LINER: (17A: [Completely overhauled cruise ship?]) – From one-liner. DESIRED ARNAZ: (28A: [Lusted after an “I Love Lucy” star?]) – From Desi Arnaz. This was the most intriguing answer of the four themes, given the fact that the original term and the pun created are related. BEST REDACTOR: (44A: [Top dog in the CIA publishing department?]) – From best actor. PARTY HATRED: (58A: [Why the loner passed up a celebration?]) – From party hat. Say what you will about Mr. Trump, but one of his nicknames, THE DONALD is pretty sweet, and it’s a very good-looking entry in the grid (11D: [Real estate mogul with a reality game show, familiarly]). Loved the touch of African geography with both KENYA (52A: [Country that attracts safarigoers]) and HARARE (15A: [Zimbabwe’s capital]), as well as European geography that’s within close proximity of each other with PARIS (1D: [“A Tale of Two Cities” city]) and IBERIA (48A: [Land south of the Pyrenees]). There’s both EDDIE (22A: [Murphy who voiced Shrek’s donkey pal]) and an EDIE (53D: [“Nurse Jackie” star Falco]), so that’s a little bit dicey. More than ok, though, since I’m not too bothered by the similarity of those answers, especially since they’re nowhere near each other in the grid. NO PETS was the refrain that my parents beat over our heads every single time any of my brothers, or myself, would broach the subject to them while growing up (18D: [“Leave your four-footed friends behind!”]). My parents were/are absolutely terrified of anything that resembled a living thing that could possibly reside in our apartment that wasn’t a human being. Thankfully, I didn’t hold onto that sentiment for too long, as I grew to appreciate dogs (and melt over the sight of boxers). I guess if you’re a pet owner that has a pet snake or fish, you’ll be insulted by this clue since those animals don’t have feet. Semantics, I guess! 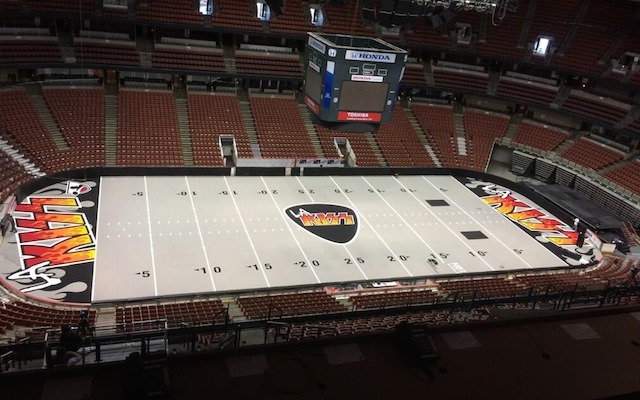 “Sports will make you smarter” moment of the day: KISS (52A: [Smooch])– Gene Simmons and Paul Stanley, two members of the iconic rock band KISS, are part of the ownership group of the Los Angeles Kiss, an Arena Football League team that plays at the Honda Center in Anaheim. The design of the team’s playing field and helmets, like the outfits the members of the band don during performances, lack for, um, shall we say… subtlety? Thank you for your time, and we’ll see you on Hump Day! 17a. [Store where Yogi shops? ], BEAR MARKET. Cartoon Yogi Bear, not baseball’s Yogi Berra. 27a. [Hangout for Mickey? ], MOUSE PAD. 44a. [Language that Porky studies? ], PIG LATIN. 57a. [Corn for Bugs? ], RABBIT EARS. 11d. [Trash in Sylvester’s room? ], CAT LITTER. 34d. [Ping-Pong tool for Goofy? ], DOG PADDLE. Cute theme. And while there are six theme answers, none are longer than 10 letters. The fill is mostly ordinary language with a soupçon of crosswordese-type fill (e.g., 20a. [Resin used in varnish], LAC; no-longer-famous OTERI). STAR crosses ARTS, and TARS is not far away. RATS and TSAR want to know why they weren’t invited to the anagram party. Four stars from me. Light and breezy puzzle. 17a. [Question for someone who’s already written “beta” and “kappa”? ], CAN YOU GET THE PHI? 28a. [Flower necklace given by an environmental group? ], SIERRA LEI. The Sierra Club and Sierra Leone come into play here. 39a. [Avril Lavigne’s take on an Elton John song? ], DANIEL BOI. 52a. [“Stop trying to imitate the best boxer of all time!”], YOU’LL NEVER BE ALI. I like that the ONE-to-I swap took place at the very end of each phrase. I also like imagining that Christopher MELONI is part of the theme, and that his name is MELON ONE. And I like seeing TAIPEI crossing two of those final I’s, since my friend JP is in Taipei this summer and blogging his experiences. 25a. [Decidedly unhip], LAME. 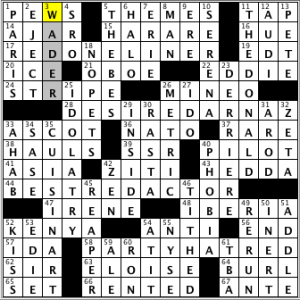 A doctor friend wishes that crosswords would quit cluing the word with non-physical and insulting connotations. 30a. [Knitter’s ball], YARN. Not to be confused with Headbangers Ball. 55a. [“Saving Private Ryan” craft, for short], LST. Oh, hello, crosswordese abbreviation from the 1940s! 4d. [Unremarkable place], ANYTOWN. Love this entry! Also like “NO CUTS” and VITRIOL. 39d. [Nittany Lions all-time leader in touchdowns ___ Clark], DARYLL. Not a familiar spelling of the name. Least familiar (but gettable) answer: 33d. [Gym teacher’s deg. (hey, it even has the class in its name)], BPE. This entry was posted in Daily Puzzles and tagged C.C. Burnikel, C.W. Stewart, Elizabeth C. Gorski, Lynn Lempel, Matt Jones, Zhouqin Burnikel. Bookmark the permalink. Although I plunked down SURE, MAN, didn’t look too closely at the cross and went cross-eyed trying to find what’s wrong. I was liking everything about this puzzle, and then I hit ENOTE. Gag. After you remove them, your lists will be trimmer. They’ll be e-lite. But if you remove too much, they’ll become e-bony. Cruciverb-l, to which a good number of constructors are/were subscribed, is an example of an e-list; so good luck getting that one to die! At Dartmouth College, there are A side frats and B side frats. The English language is a marvelously flexible thing. Random question… My NYT crossword subscription expired over the weekend – I used their app for the past 2 years – and it’s $40/year to renew. 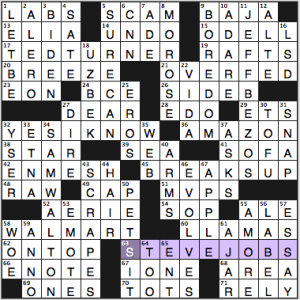 Is the quality of the NYT puzzle significantly better than LAT and other cheaper / free daily offerings? 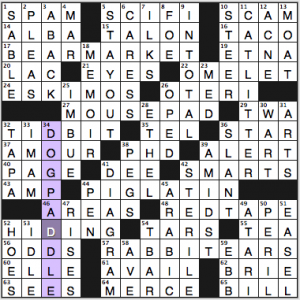 I typically only do 1 puzzle a day, so I haven’t delved into much beyond the NYT, Matt Gaffney’s Meta, and a sporadic LAT puzzle. I’m planning on continuing as-is, but I’m wondering if the drop-off will be noticeable and make me want to head back to the NYT based on superior quality. Thanks! I used to think of the NYT as the gold standard, but these days I actually prefer the LAT; YMMV. If you enjoy the MGWCC puzzles, you would probably also like the various indie puzzles more than the NYT or the LAT. BEQ’s “Themeless Monday,” Matt Jones’s Jonesin’ on Tuesdays, the AV Club on Wednesdays, BEQ’s themed puzzles on Thursdays (plus the Fireball, but that one isn’t free), and the other weekly or sporadic indies to fill in your weekends (all free: Erik Agard, Neville Fogarty, Andy Kravis, Andrew Ries, Peter Broda, Evan Birnholz, Patrick Blindauer, Todd McClary, Pete Muller’s Monthly Music Meta). Nice – thanks Amy and Margaret! Jonesin’: I was slow picking up the theme so I had a great “Aha!” moment when it came to me. I did not know either VMA or MELONI so that final M was a guess. BPE was also a guess but pretty easy given the crosses and clue. 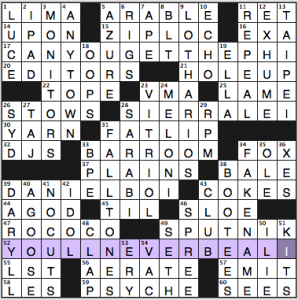 Still, even if I had gotten both wrong, the puzzle would have been worth it. I just came back to check the write-up for the CS puzzle. Wow, Ade, what a fascinating “sports will make you smarter” tidbit. I had no idea about the KISS team!